I could be wrong, but I think they get a brief mention in LK Woods’ account of their trek to find Humboldt Bay. 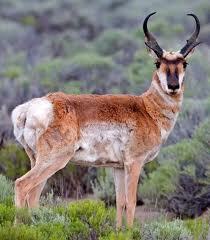 Pronghorns may be the fastest herbivore in the world. They evolved to run away from the extinct American Cheetah (Miracinonyx inexpectatus and M. trumani.) There are 14 named species or pronghorn, 13 of which are extinct. No pronghorn is known to have existed east of the Mississippi for one million years. Most definitely Humboldt county was home to one or more of these species in the recent (10,000 ya) past. The pleistocene extinction event must have disrupted their range considerably. I can find no hard evidence that pronghorn have been found in Humboldt for 10,000 years, but? Fossils are hard to come by.